The United States (US) has imposed sanctions on Venezuela’s state-owned oil firm PDVSA and urged the country’s military to accept a peaceful transfer of power, says report. 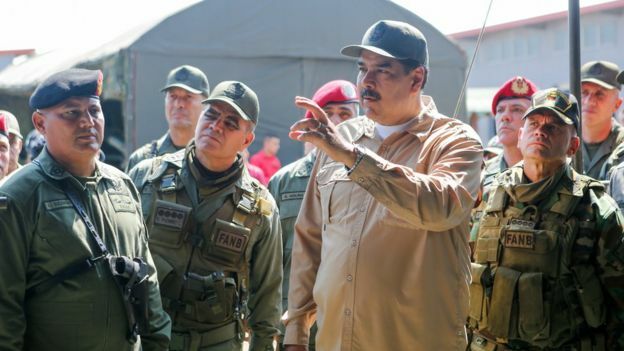 According to National Security Adviser John Bolton, President Nicolás Maduro and his allies could “no longer loot the assets of the Venezuelan people”. In recent days, efforts by the opposition to unseat President Maduro have increased. The US and more than 20 countries have recognized opposition leader Juan Guaidó as interim president. Treasury Secretary Steven Mnuchin said the proceeds of the purchase of Venezuelan oil would now be withheld from Maduro’s government, but the company could avoid sanctions by recognizing Guaidó as the country’s top leader. Maduro later announced he had told PDVSA to launch “political and legal action, in US and international courts” to protect its US subsidiary Citgo. Both Bolton and Mnuchin said the sanctions were intended to prevent Maduro’s government from taking funds from the state oil company. “We have continued to expose the corruption of Maduro and his cronies and today’s action ensures they can no longer loot the assets of the Venezuelan people,” Bolton said.